UPDATE (August 2018): I have just finished my second Camino. Please check out this new and much improved packing list: My Ultralight Camino Packing List. 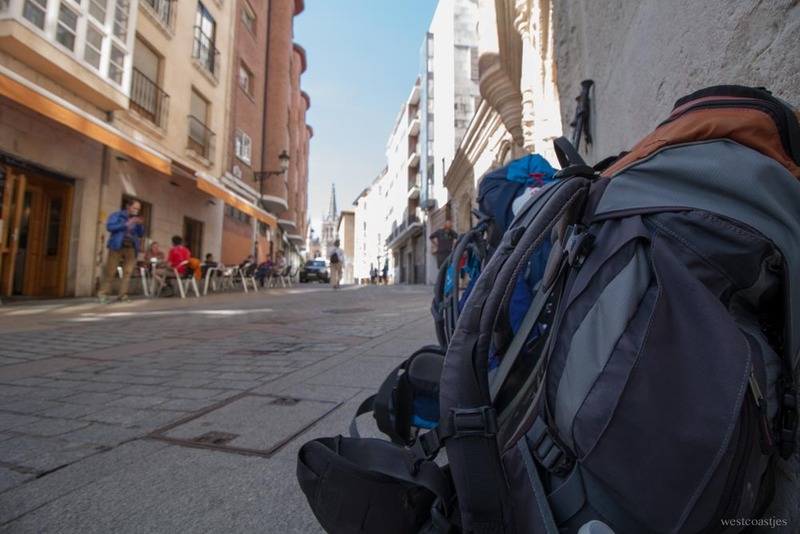 I spent about a month carefully researching my Camino de Santiago packing list. Then I went on my trip and realized I was wrong … I brought way too much stuff! I ended up leaving behind a lot of items — sometimes expensive or beloved things. In hindsight, here is what I wished I had brought with me instead. Check what the average temperatures are for when you’re going. I went in May & have a tendency to run cold. If you went in the summer, you’ll need a lot less. Not a fan of ponchos — they are flimsy and hot. Also, I ditched my rain pants. You are going to have a hot shower and a dry bed every night. Who cares if you get a little wet? Stopping to take care of a hot spot with mole skin — didn’t work! Despite my friends’ advice, I brought my trusty lightweight hiking boots and wool socks. I’ve been hiking in this gear for long trips for years. Everything was well broken in. I’ve never had a blister before. And then I got the largest, grossest blisters in my first few days of my Camino. My feet were so hot, so sweaty, so swollen. So going to try the running shoe route this next time around. I saw that a lot of people recommended a silk sleep sheet, which I did bring and really enjoyed on hot nights. I am not sure it’s worth the weight though. And I ditched my pillow case. Just put your head on the pillow and carry on! A very clean, well apointed and busy albergue in Burgos. There is a spork in this photo. Don’t bring a spork. You can also buy a credential when you’re in Spain. But I liked having one different from everyone else… harder to get mixed up! Very small passport wallet that buckled around my waist to keep passport, cash and cell phone on my person at all times. I loved bringing my new smart phone with large screen. It was my GPS, my Kindle, my podcast player & one of my cameras. I brought my very tiny Canon SL1 (the smallest DSLR ever made), two medium sized lenses and the associated accessories. It was the heaviest thing in my bag by the end and at times I was not happy to see it in there. But I also loved that I had decided to make this sacrifice to create opportunities for me to express myself artistically, have meditative time away from the crowds, and improve myself skills as a photographer. I used my camera a lot, but it definitely was a conscious and sometimes difficult choice to go use it constantly. Despite this, a lot of my best photos ended up being taken with my cell phone as it fit in my pocket. (It’s a Samsung S6, which I chose for its camera). Since I was struggling with the physical challenges so much & my cell phone pictures were great, I probably won’t take my DSLR next time. Stuff I ditched on the first morning. Don’t bring so much stuff. And don’t bring your favourite things or nice new things, as you may be getting rid of them. I thought it would be chilly in May. Did you stay warm without a fleece or something similar? I think it was much warmer than usual this particular May. And When it starting getting cold (9pm), I was in bed! And if it was cold in the morning, I just walked briskly. This is the best list I have found so far! Thanks for sharing! I will be walking in mid April through May. Where did you get the Canadian passport?